For MFT's Wednesday Challenge Club post please scroll down! Welcome to our Samantha Walker Creative Team Monthly Blog Hop! Are you ready for some inspiration? You should have arrived here from Nancy's blog, however if you didn't, you should hop onto Samantha's blog, as that is where all the pretty creations start, and you don't want to miss out! My post this month is sneak peeking a brand new stamp set of Samantha's by Unity Stamps. Gosh, I can not tell you how much in love I am with these new stamps of hers. And guess what? If you are like me and LOVE dies, some of Samantha's Unity stamps are coordinating with Spellbinders. When I first found out about that, I about died, what a match made in heaven, if I may say so. Of course I don't own those dies (YET!!!! !...LOL), so my stamping were hand cut. This set's name is Twisted Metal. If you love pretty labels, I guarantee you will love this set, just like I do..
Now, here is another little news about Samantha. The first time I found out about Samantha was through her Silhouette cutting files and I fell in love with her designs right away and have used them a lot. Well, these past few months, she hasn't been posting new cutting files for my sadness, but no more! She is back and she has posted quite a few new files already. 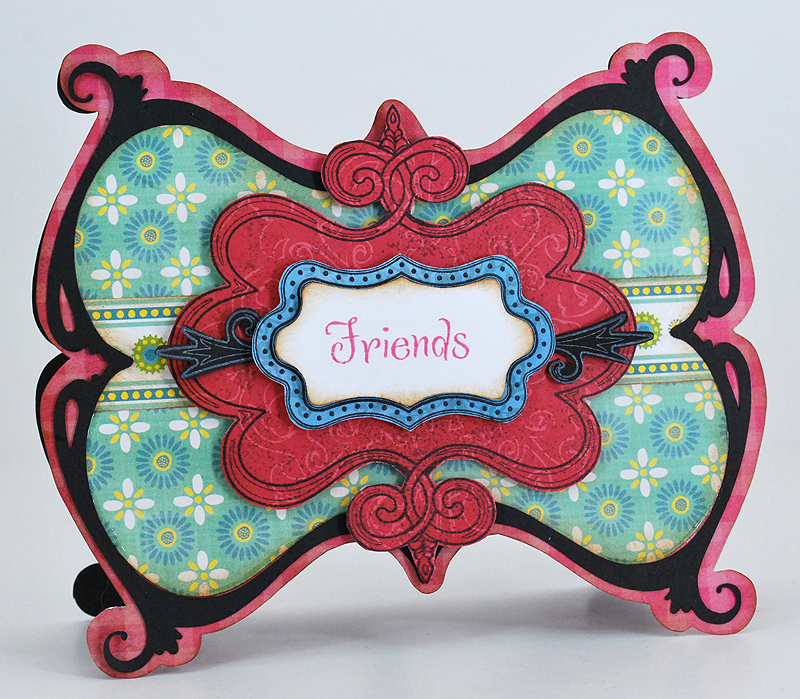 My card today is showcasing one of her newest Silhouette cutting file called Frame Rectangle Flourish. I would have loved to link it, but I just can't. Here is what I came up with. Isn't this a gorgeous framed card? I also used Samantha's Creative Imaginations papers called Heidi and mixed in some of her Ooh La La line. My card base was cut using Creative Imaginations Cardstock Foundation paper line. So, what do you think??? Hope you love it as much as I do. Hope you have a great hop and I know Samantha has some awesome goodies up for grabs, but for now you are ready to hop to Guiseppa's Blog. I know she has something amazing waiting for you, so you don't want to miss out!